How to delete bookmarks on Android phone? When browsing webpage on Android phone, many people usually add some bookmarks to make it easy to find the webpage later. However, the bookmarks on Android device could become needless after some time. So how to delete bookmarks on Android phone? Let's see how to solve this problem together. You might have added bookmarks on different websites, such as Google, Wikipedia, Amazon, Facebook, Twitter, BBC, Yahoo, Baidu and etc. Don't worry, you can delete them from your Android phone. But you can only delete one single bookmark on Android phone at one time. Let's how to make it. Step 1. Launch the Web browser that contains the unwanted bookmarks on your Android phone. Step 2. Locate the bookmarks on the Web browser. On most Web browsers like FireFox or Google, simply tap the address bar and select "Bookmarks" tab. Step 3. Choose one unwanted bookmarks from the list, then press and hold the bookmark for a while. Step 4. On the pop up menus, please choose "Delete bookmark" option to remove it from your Android device. Step 5. Repeat the above steps to delete another bookmark from your Android device. 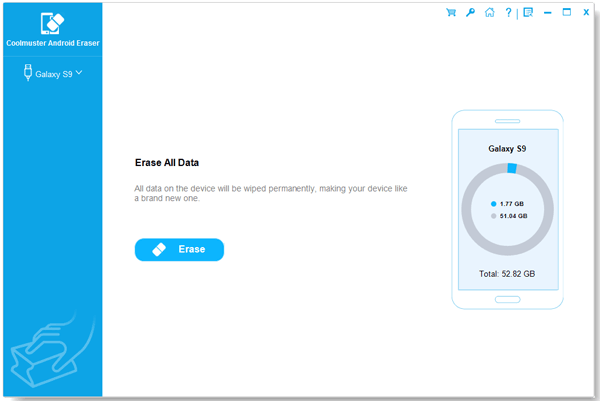 Besides Android bookmarks, you can also delete the other Android data, such as photos, videos, contacts, text messages (SMS), call history, search history, notes, documents and etc. And it is fully compatible with all Android devices, including Samsung, Huawei, LG, HTC, Sony, Motorola, ZTE, OPPO and etc. Now, please download the Android Bookmarks Cleaner in Windows or Mac version on your computer as below to easily delete Android bookmarks. Tips: Before going further, please remember to backup your Android data at first, avoiding losing data you need. Step 1. Run the Android Bookmark Cleaner on your computer after downloading and installing, and link your Android phone to computer with a USB cable. To successfully detect your device, please install the MobileGo Connector as prompted on your phone. Step 2. When the program detects your Android device successfully, please choose the right erasing mode and erasing level from the interface. Then the program will automatically scan for your Android files. To delete bookmarks on Android phone, please select "Erase All Data" mode and hit "Erase Now" button on the bottom. Then type "delete" on the pop up window to confirm your action and start to delete all data from your Android device, including the bookmarks on Android. Well, the whole process is done. Se easy! If you need to restore your data to your Android device, please check the user guide on how to backup and restore Android device.